Another actor in costume photo from the golden age of CDVs. Miss Sallie Holman dressed as Ike Partington (if you couldn’t tell from the name, a comedic role involving gender confusion/cross-dressing). 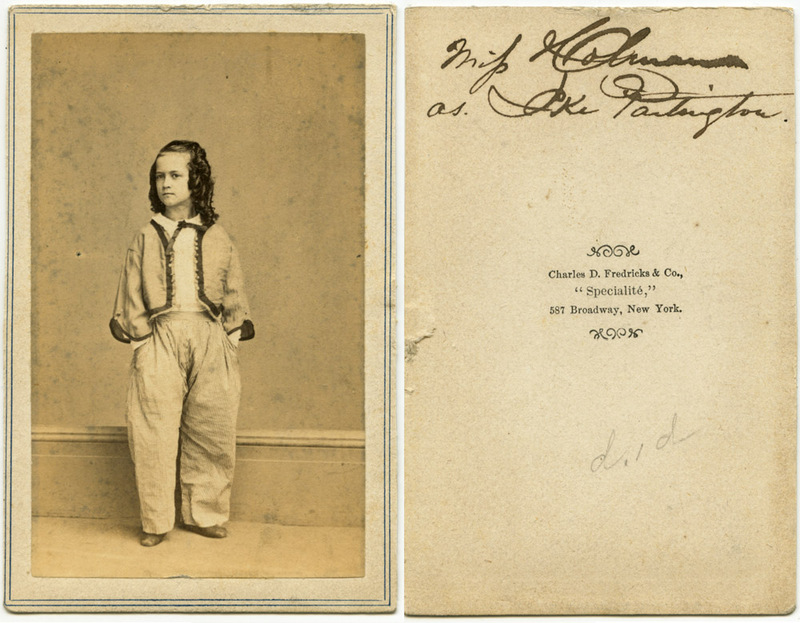 This one hits on all the notes – a great CDV of a performer in costume, cross-dressing, “gay interest”, celebrity photographer. This is somewhat equivalent to the famous Garbo-in-a-tux photo of the 1930s, or Dustin Hoffman as Tootsie. CORRECTION: It is Ike Partington, so I have corrected the title and elsewhere to reflect that. Great photo! I think the character’s name might be Ike Partington, which appears to be a juvenile role, kind of like all the women over the years who have played Peter Pan. What’s astonishing here (to me) is how truly young she looks, and how well the costume masks what is presumably a feminine body underneath. I wonder how old she actually was at this point. Old theater stuff is so fascinating to me, thanks for sharing it. Sallie married James Totty Dalton in 1851 Massachussets who was from Penn, Staffordshire, Engald UK, his father was the brother of my gr,gr,grandfather and was also named James Totty Dalton. I am trying to find a photo of him but have had no luck at all. Does anyone know if a photo exists of him? He was a baritone and appeared with the Holman Opera Co. and often with Sallie. i have some photo’s I have found of Sallie and her brother and sister but would also like to find one of her father George Holman. I would be happy for any help if anyone has any information, My email address is laviniahemingway@hotmail.com. I’ll keep an eye out if I ever come across any photos of Mr. Dalton, but the Mr. Dalton who was your relative is from an earlier time period and so may never have been photographed. I’m by no means an expert on the history of theatrical images, but it seems from my experience that they began in the 1860s and really took off in the 1870s. Prior to the 1860s, most photographic images were unique – be they daguerreotypes, ambrotypes or tintypes, they could only be copied by making a new photograph of the original. I have just found your reply as I haven’t looked on here for a long time. Thank you for your response. I recently found two old photo’s of an R.T.Dalton Montreal QC 1880 which I am hoping could be James Totty Dalton as there could be a mistake with the initials. I found some of Sarah (Sallie) Holman at the same time, it was on a site called the McCord Museum that I found on the net. If you are interested have a look. I have put a message on there hoping that someone will contact me but they haven’t so far. Living in England doesn’t make it any easier as I can’t go to visit any of these places. I would love to find if it is actually him. Also looking for photo’s of Sallie’s parents George and Harriet Holman.